Yesterday was my Monday, and today is my Friday. Too bad every workweek can’t be just like this one. It’s still hard to fathom that Christmas has come and gone. Every year there’s so much buildup, and then it’s over in a flash. 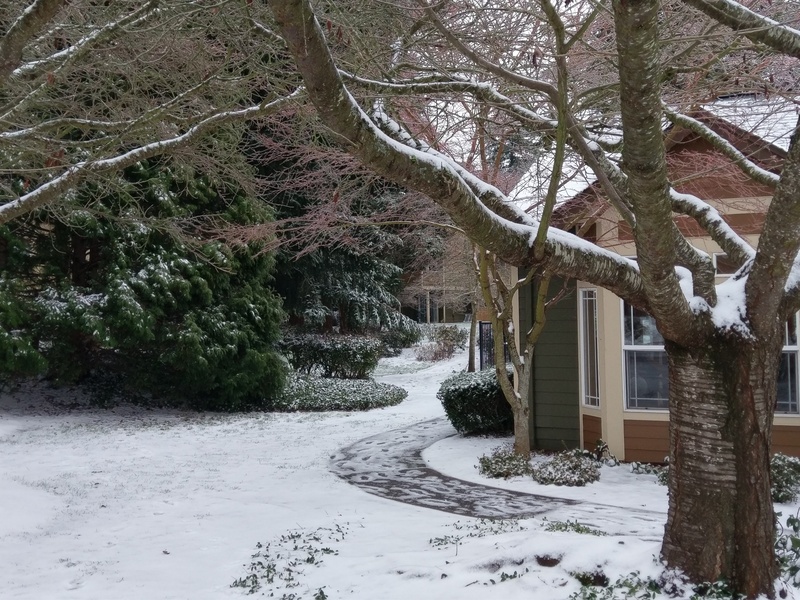 The holiday felt extra special this year, because we ended up with a rare white Christmas. How rare, you ask? 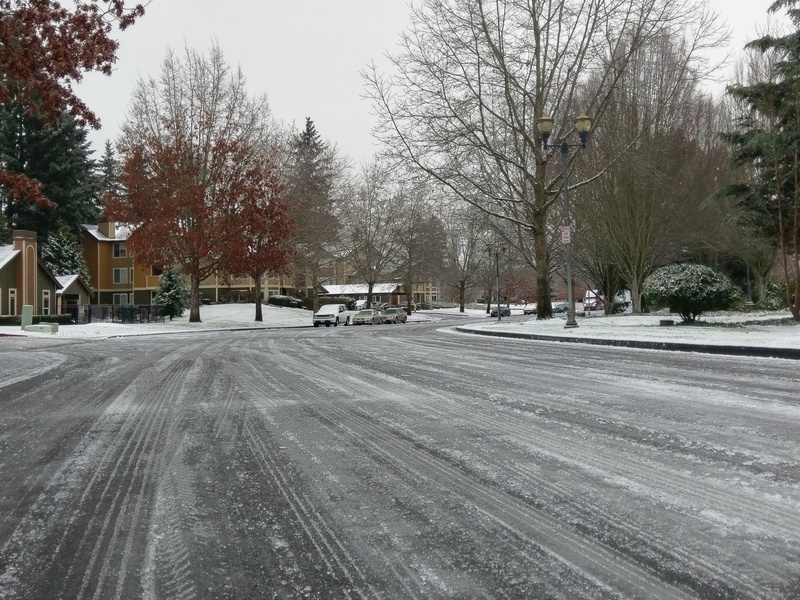 Portland has only experienced a white Christmas six times since 1884. Last Friday I took a PTO day and drove myself into Portland while Tara was busy at work. 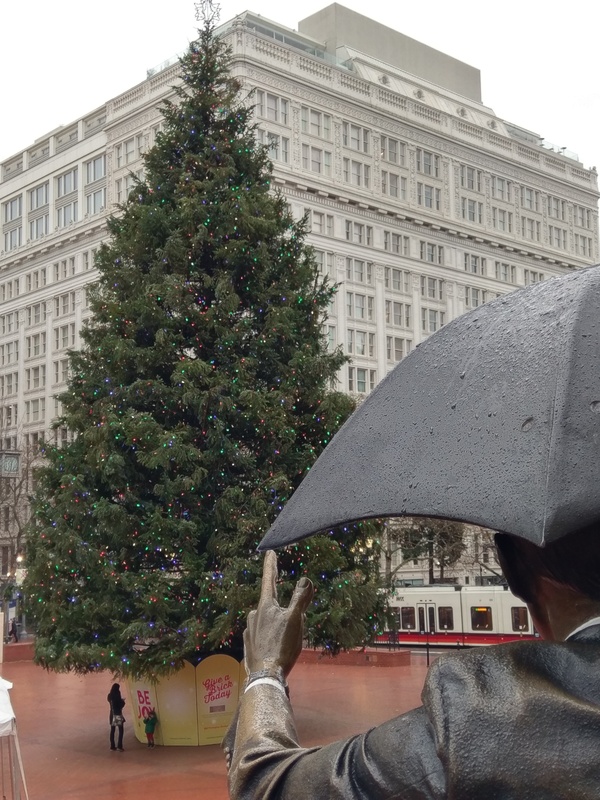 Even though it was cold and damp, I spent a few hours walking around the city, admiring the sights and sounds of the holiday season. 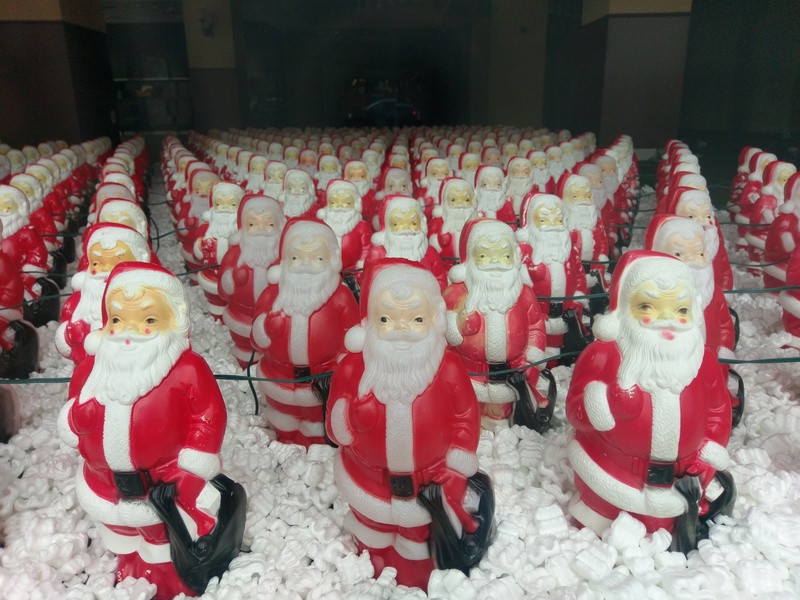 Like the Santa Clones display, a collection of 350 plastic Santas hidden somewhere in the city every year. And Portland’s official Christmas tree in Pioneer Courthouse Square. 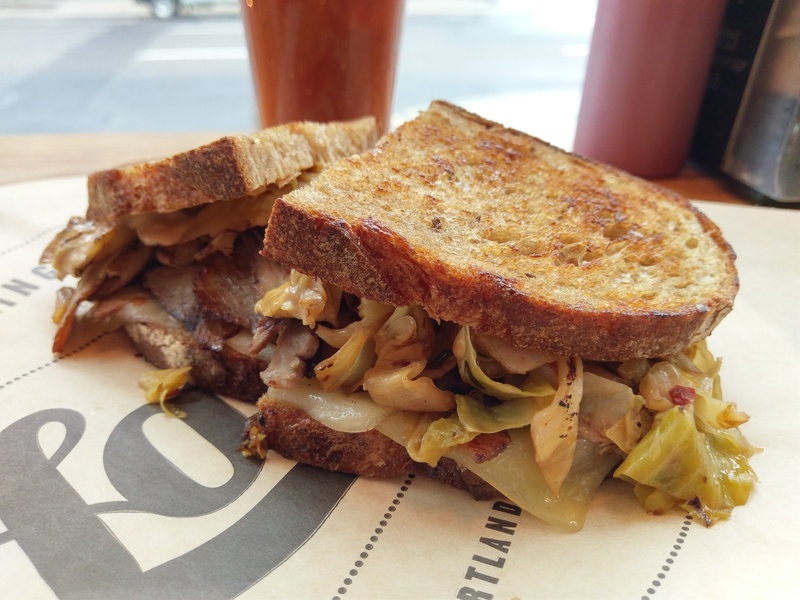 But my favorite sight of all might have been this amazing Char Siu Reuben sandwich from Lardo. Shout out to our foodie friend Kara for this delicious lunch suggestion. We spent Saturday in Tacoma, visiting Tracy and family. While my pork carnitas were cooking in the crockpot, we whiled away the day drinking, snacking, and playing cards. I only left the apartment once, to walk across the street and buy a sorry-looking pair of limes from the corner convenience store. The clerk was nice enough to sell them to me for half price, which gives you some idea just how pathetic they were. When a mini-mart starts discounting their produce you know it’s waaaay past its prime. In any case we had a very nice visit, and ended up opening Christmas gifts that afternoon rather than waiting until the next day as planned. We could blame this on Anthony, who at five yeas old might reasonably be expected to want to tear into his presents early, but he was too preoccupied with video games to give much thought to anything else. Nope; this was a case of impatient adults. Dinner was a hit, and afterwards we watched Home Alone. I’d ordered it on BluRay for Tara, who had been looking for it in stores without success. Sunday morning Tracy made biscuits and gravy for breakfast while I kept checking the weather on my phone. Snow hadn’t been in the forecast – they were expecting rain, sleet, or freezing rain instead – but Mother Nature never asks for permission, does she? 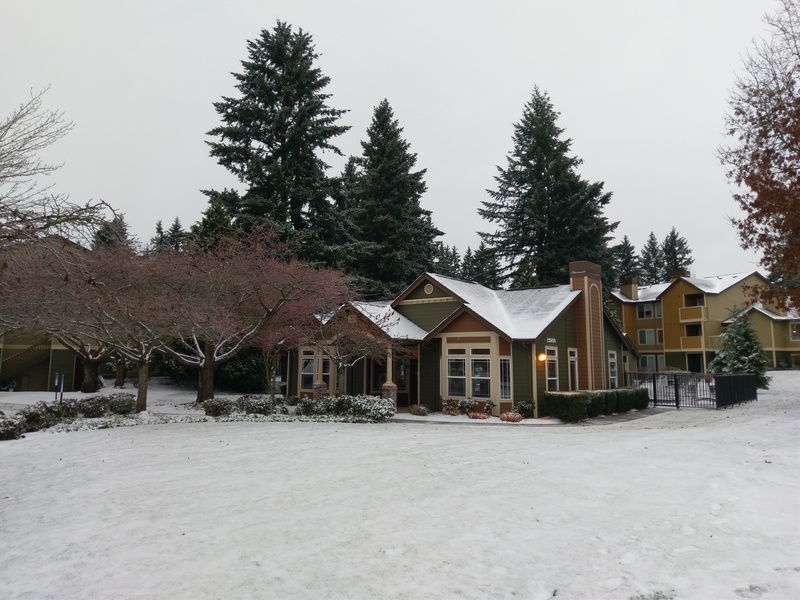 My mom texted me pics of the surprise snowfall in Vancouver, and then my aunt Nancy in Newberg, Oregon cancelled our planned Christmas Eve dinner at her house because of deteriorating traffic conditions, so I was anxious to hit the road. We finally did, a few minutes after noon, following a quick stop at a Safeway in Lacey to pick up some groceries for dinner. The place was a madhouse, as you might expect. Back on the interstate, it started snowing just south of Olympia and continued the whole way home. As much as I enjoy our annual “ethnic Christmas Eve feast” at Nancy’s house – a meal that usually consists of pelmeni, borscht, and cabbage rolls to honor our Eastern European heritage – sipping wine and watching Christmas movies while wrapped in a cozy blanket at home, watching the snow fall outside, was pretty nice. Christmas morning, we awoke to snow on the ground. It wasn’t a lot, only about an inch, but it sure made the holiday feel extra festive. The roads were coated in ice and too treacherous to drive on safely, so we cancelled our planned breakfast with my parents and hung out with Audrey instead, opening gifts. The temperature never climbed above 34, but roads thawed out enough to allow us to go to my parents’ house for dinner, where we had the usual prime rib, mashed potatoes, green beans, and cheesecake. Good stuff. Less than 24 hours later, all the Christmas decorations were packed away save for the tree. I know there are a lot of people who like to keep their decorations up well into the new year, but I have never been that guy. I get antsy once December 26 rolls around and am ready to have the house back to normal by then. The only reason the tree stayed up is because I ran out of time and energy on Tuesday. And yes, it’s still up today. I have to grudgingly admit that it’s a nice compromise, having everything packed up and put away except for the tree. Maybe it’ll last until New Year’s Day (though I make no promises). I realize that beginning next year white Christmases will be less of a novelty, but I sure did enjoy this one! Is it just me, or is that the widest street ever? Also… you guys still have Safeways out there?? Wow. They’ve closed them all around here. I didn’t know they still existed. It makes me happy to hear that, though. I remember them from when I was a kid; nice to know they’re still around somewhere! Now that you mention it, the street does look awfully wide, huh? I don’t think I ever noticed that before. You could probably land an airplane there if necessary! Yes, we still have Safeways. I’m not a big fan – they tend to be expensive and crowded. Personally, I miss Albertson’s – which were, ironically, all bought out by Safeway. Envious of your white Christmas, Mark. Parts of the PA had a lot of snowfall Christmas Eve and Day, however, we in the city got NADA 🙂 Only one year did we get snow on Christmas Eve/Day, which was the second winter since moving back here. And like you said, it was MAGICAL! Love the picture of the Santa’s. Stellar shot! Wishing you and Tara a Happy New Year! Bummer, Ron! I was hoping you were enjoying a ton of snow yourself. What’s the point of cold weather if there isn’t some snow accompanying it? 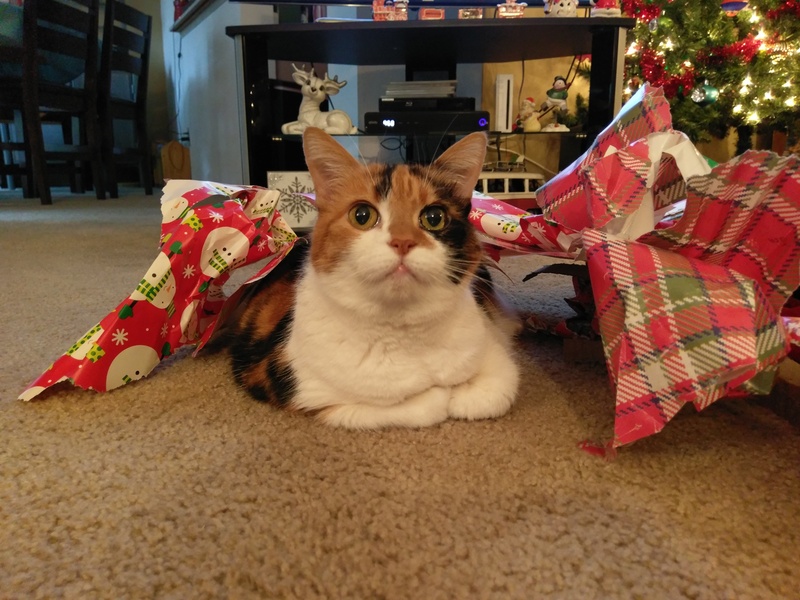 In any case, I hope you had a nice Christmas. Happy New Year!! I’m always over Christmas AND snow by January 1st. Too bad I can’t send snow back down to the basement.